Day 8 of this trial is expected to be entirely taken up with the cross-examination of Angela van den Bogerd, a Post Office director and most senior Post Office person at this trial. We are in Court 26 ready to begin. Judge has walked in. Angela van den Bogerd (AB), Post Office Director, is in the witness box. Cross-examination by JFSA silk Patrick Green QC continues. … any further losses which arise during the authority period must be made good immediately. QC do you accept this is a standard letter? … one of the payments. … no investigation has been carried out. correction - not an internal email - it’s a reply to Liz Stockdale. The email also asks Liz which product she made the loss on. AB says she still can settle centrally and that’s how I would read that letter. … or is what you think he means is rather different what he appears to be saying. 3. No more than two repayments in 2 years or more than one going at once. … to a document they can all see, which I can’t]. Judge we’re rather gliding off the point. This is about a period when they are already having deductions. QC says that part of the policy is still in place? QC suggests that the situation is the same now as 1998. If you are already repaying a loss, you have to make any further losses good immediately. AB agrees position hasn’t changed. AB I can’t recall the document but I know the situation is that under repayment SPMs can still dispute further shortages. Judge says he is sure PO QC will find this document if it exists for re-examination. We move on. Also notes the terms of this document has the phrase SPM is responsible for ANY losses caused in branch. QC that’s wrong isn’t it? QC but expressed there, it’s wrong. QC are you aware that SPMs should be expected to understand anything they settle centrally as a debt? AB I wouldn’t use the word debt. AB you want a date? QC in attributing responsibility for transaction corrections [in a period I missed] 19044 caused by branch 84,614. So by the PO’s own figures, around 20% of TCs are not caused in branch. … were caused in branch. That’s a v high proportion on the branch side. … occasions there had been TCs sent to branches for errors which were not their fault. That is something SPMs had to spot. Otherwise they would be potentially liable for that loss, unless the cash centre spotted it. AB they are required to check their cash on receipt. QC goes to a document called a Working Agreement about financial services. QC which is less than three months. QC lists other examples of larger TC which might come down within 2 years - again, he says - longer than 60 days. QC makes point that criteria for communicating with SPMRs re large TCs..
… if it affected more than 10% of the network and if it fell outside a specific period in the working agreement. QC points to another document about reviewing TCs “to correct accounting errors in Horizon"
It is a 10 Feb 2010 doc which aims to stop large scale TCs coming down to a branch which don’t actually affect that branch (among other things). QC goes back to document which states as policy not to issue a high value TC on a monday or tuesday before rollover day. Now talking about compensating transaction corrections issued to correct TCs made in error. QC says that one of those TCs HAS to have been sent in error, yes? QC that shouldn’t be controversial. QC goes back to Liz Stockdale issue. It’s very hard for her to effectively dispute something when she doesn’t know how it has been caused. … cos she was on a promise of a correcting TC. and that’s one of the reasons why errors may occur in branch accounts..
… as well as human error there is also the possibility of Horizon error? QC moves on to talk about lottery TCs. They can be very large. … are appropriate", the others are complaints about how to settle centrally. ...and that this is not that helpful to SPMs. QC it appears to be Camelot yes. QC then goes to something from Horizon data about information attached to TCs and says that if SPMs cannot get to the bottom of the reason for a TC, the SPM has to accept it. [AB says something like this is a document aimed at trying to improve a situation] - sorry I missed that. QC now on to another document in which concerns are raised about the use of cheques in and out of branch. QC gives an example on an excel spreadsheet of how a TC comes down to an SPMR - date, reason, amount [in this case a Child Trust Fund payment wrongly taken over the counter]. Then he goes to one which warns of a TC coming on a specific date, which doesn’t come. [this is Naushad Abdulla’s branch (he is a lead claimant)] The TC that was due to come was to balance a debit TC of more than £1K. When it does come, it is another debit TC, putting him more in debt erroneously? Judge do you accept this? Judge - no no - do you accept that on the face of it, this is an error? AB on the face of it, yes. … sheet I can’t see. QC ends up reading an spology from PO to Mr Abdulla, but QC says more than one error has been made here? QC lists errors, AB interrupts says I’m not sure there are that many. QC three times for £1092 when you were only expecting one, then you can see why they have these concerns? QC moves on to a document about a service level agreement culture within the Post Office - so diff depts within PO have to provide each other with a high level of service. It is HEAVILY redacted. QC let’s say you did. QC brings up wild monthly variations in TCs why? … March’s Horizon trial in which she explicitly addresses the issue. Either you are not aware of what’s in your witness statement or you are not coming to it cold. AB says she would like to see what’s in her witness statement before commenting further. Judge asks for AB to have her witness statement provided to her. QC says TCs require data to be entered manually and that manually entered data can go wrong. He shows examples of mistakes by PO in evidence. His point is manual error is a risk in TCs, yes? … which shows wild swings - 12K to 108K - in total numbers of TCs from one year to the next. Then points out 2009 - 2011 data which again show wild movements in the values of the TCs from one year to the next. QC goes to wild value swings (+ or - a few million) again and notes in 2015 there were +£42m in TCs done. Can she explain why? AB has no recollection or knowledge of why this figure is as it is. AB explains that they were having difficulties with Camelot data being manually entered into Horizon so they semi-automated the process. AB so happy with H help content but she wanted an easier way to search for that help in branch. QC says we’ll come back to this. QC notes a new document in which AB says Horizon help has been substandard. So you’re being honest in this appraisal here? QC notes this document (co-authored by AB) states an need for better access to Horizon help through an intuitive search function. Has this been introduced? QC and that document was written in 2016. QC lists other things in the document about problems with Horizon helpline and notes it says that the impact of failing to introduce it is continued poor user experience of Horizon. This is a candid internal document? QC draws a parallel with AB’s written internal appraisal and that of a sacked SPMR Liz Stockdale. Does she accept? AB my problem was more of the speed of access to the content, not the content itself. … as being “difficult to use”. Now thinks he has made the point that AB’s own words validate difficulties for Horizon help as an issue. QC quote from process map which asks if agent can provide timeframe of specific fault? QC did you ever tell SPMs a Horizon Challenge Process has been introduced internally to investigated Horizon errors. QC goes back to 2010 branch mismatch error which has been in the news recently. Says this is a very niche Horizon error which would not be picked up in branch yet they SPMs potentially being held liable for it. Is that fair? that are in place to find the source of the error which is an investigation involving locating the problem in branch and getting to the bottom of it in a structured way. … that SPMs cannot understand where they came from. QC suggests the tables are turned when SPM gets a TC x months down the line and wants to challenge it. It’s very hard isn’t it? AB but a TC comes with supporting evidence. QC goes back to payments mismatch issue affecting 40 branches. None of the SPMs had spotted it. … could identify the source of their losses if they didn’t know the cause. QC now asking Ab about the payments mismatch memo in detail (which I published on postofficetrial.com) - asking why they were not telling SPMs about this. QC well let’s see what you could have communicated. This fault was found in May and the memo was written in September - so 5 months you’ve known about this and not told them. QC explains how serious this fault could be to SPMs and the corrections being discussed. QC no suggestion here that PO can’t change branch data here is there? QC clearly it’s seen as a bad idea to let anyone know what has been happening. QC notes group recommends solution 2 should be progressed. AB it wouldn’t have been done without their knowledge. QC why not just reply saying yes then? AB I’m not familiar with this specific incident. QC Thank you. would this be a convenient moment for a break, my Lord? … she was shown “coming to it cold” i think were her words. QC suggested either she didn’t know about the contents of her own WS or she was not, indeed coming to it cold. AB will now read her new WS again over lunch and be asked about it afterwards. 2.21pm We’re back. AB is being asked about her witness statement for the next trial in relation to her comments earlier today about an excel spreadsheet containing info about Naushad Abdulla’s branch. QC establishes that when AB said she was coming to it cold, she was mistaken. QC I suggest to you you are hesitant to accept things which are damaging to the Post Office. Okay we’re back. Talking about the Post Office’s Horizon Management Council which AB has no knowledge of. …. bringing in data from branch auditors. It also talks about errors in Horizon, deletions caused by super-users and the need to keep track on them. AB says she understood that tracking deletions has always been in place. She has not seen the document we are looking at b4. The document was in circulation around the same time AB’s Branch Support programme was running. She says she has no knowledge of the issues in this document affecting the Branch Support programme. QC now reading from the Branch Support programme internal document which recognises need for better training and support, but which says Horizon is in good nick. I think they’re still talking about this Branch Support programme scheme scope which AB ran in which the issues raised by Second Sight’s interim report will be explored. I think. QC making the general point that the fact these issues have been raised means and are now going to be explored by AB’s team suggest they have some merit - they include defensive attitude from PO staff, problems with training and more. AB agreeing these issues have been raised. … and then says it gets reinforced during onsite training. Sue goes back to training provided to SPMs in 2002 from anecdotal evidence. She says she can find no evidence of formal classroom training just some business awareness customer care use of the date stamp etc. QC goes to another document which spells out a particular SPM training session. It doesn’t make explicit any training on dispute/balancing? QC that can’t be got through in half an hour, can it? with an extra step, which is that you had to input the information into Horizon. QC pauses to say should it therefore be switched of…. … off 25 times in one day? QC that would be a *bad* idea wouldn’t it? deliver a lot more information in-between the slides. QC sums up all the training and says it’s great if you want to check your stock of stamps, but not if something goes wrong. QC moves onto a different point in training which encourages SPMRs who have stock differentials to put fake transactions through Horizon. System thinks you have 225 stamps, in fact you have 221, so you have to sell 4 stamps to balance the system. Judge intervenes - he is very interested in this. So if a customer comes in - he asks - and wants to buy 4 stamps and hands over the money the process is exactly the same. Judge - but if the SPM does this without money changing hands it balances the system. QC moves onto wrong number of stamps being sent out. If PO sends out wrong number of stamps and SPM books them in and doesn’t notice it’s their liability. .. have to go wrong - the PO sends the wrong stamps, the SPM doesn’t notice - it’s the SPM’s liability. QC what about the other way round. If the SPM makes a mistake and PO doesn’t notice - whose responsibility is that? QC who is liable for the loss? AB says some people were saying it was an issue, but it was not thought generally. … to take it all on board”. Basically notes from trainers saying training was an issue. AB don’t recall seeing this document. It was in 2011 as we were going into the NT programme - looking at whether training was sufficient. Actually there is a final comment from a trainer which suggests that SPMRs should get two audits in their first 6 months - a compliance audit after 3 months to identify gaps in knowledge and a a follow up after 6 to see how they are improving. This would make the audit process part of the training rather than something potentially punitive. I have moved position to the left hand side of the room, closer to the claimants’ side, to better hear Mrs van den Bogerd speak. I am now staring at the back of her head, but am nearer so I can hear her much better. It’s weird tho. I was warned these courts were terrible for journalists, and they are. You either can’t hear or can’t really see. Add to that no access to the documents being discussed in court as they are being discussed. I accept the latter point is true of all of these things, but in criminal courts they do generally stick things up on a big screen for all to see. Moan over, judge is back. Court is sitting. QC asks AB to tell judge if she was aware in 2015 that there were problems with the PO’s training. AB she says there wasn’t really a thought that there was a problem with training at this time. as a result of product changes thrown into relief by insufficient training. Doc goes onto outline problems and notes that there are structural issues and lack of responsibility for training across the PO which is causing problems. … the fact that training was done by different parts of the PO - initial training, product training. QC doc concludes training should be harmonised and brought on-brand and made more user-friendly and a group established to over see this. AB my recollection is that lottery was still a concern because of the number of errors, but I can’t recall what we did about it. QC there isn’t much about your recognition of problems with training and what if anything you did about it. QC lists problems complainants were having. Were you aware of that? Did you recognise that? AB a small number of people said they had problems and we looked at them and made changes. QC raises Internal Memo re Branch Support programme in response to Second Sight report. Lists changes - classroom training, contractual obligations, accounting consequences, revised balancing guide has been introduced to help new SPMs balance correctly. QC why not send these to everyone? QC can we move onto the helpline? PO holds that the helpline is not script based. Judge - is reading out the information in an article any different from a script? AB if you have a script you stick to specific words - that isn’t quite the same as what happens on the helpline. so therefore in her understanding, she would not call them scripts. Did you give any thought to updating your views? AB If I thought they needed updating or things had changed I would have updated them. Surely a robust system means checking for the root cause of any error? to Fujitsu and it was fixed. So we can see how if things don’t get investigated and fixed they can return? QC goes on to instructions to SPM for disputing a TC - saying it’s much like a grievance procedure. the SPM must place in in the Post Office and the PO must exercise that trust in good faith. “I know how hard you find it to rein yourself in when you think you’re on a roll." Bearing in mind there will be some re-examination by the PO QC and the judge has some questions for Mrs van den Bogerd, he asks her to come back tomorrow. Court has finished for the day (apologies for the long gap between this and the last tweet). We will be back for more from Mrs van den Bogerd at 10.30am tomorrow. 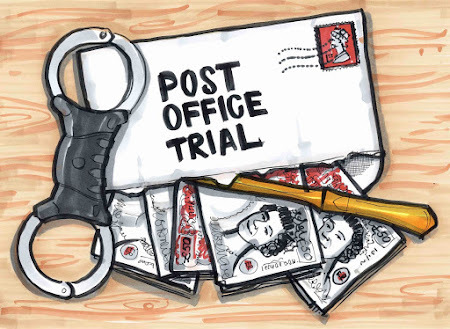 Please check in on postofficetrial.com for a write up before 9pm tonight. If you’ve enjoyed these tweets and can chuck a couple of quid in the tip jar, please go to postofficetrial.com - if you’ve already donated - more power to you. Thanks. I am very grateful.